The Boston Symphony Orchestra has announced its 2019-20 season which will feature the world premiere of my Concerto for Orchestra (a BSO commission) on their season-opening concerts, September 19-21, 2019 in Symphony Hall, with Andris Nelsons conducting. Later in the BSO season, on March 22 in Jordan Hall, the Boston Symphony Chamber Players will reprise my trio, “Why Old Places Matter,” that they commissioned and premiered in 2015. Violinist Stefan Jackiw, clarinetist Yoonah Kim and The New York Classical Players, with conductor Dongmin Kim, will premiere “Double Concerto” in New York City in May 2019, a co-commission with the New England Philharmonic. 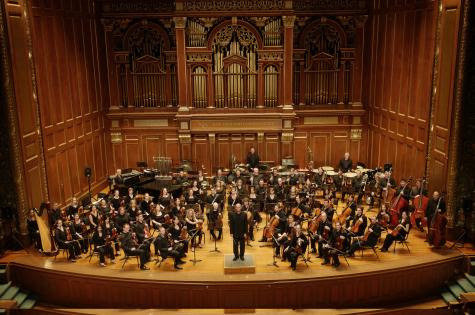 Jackiw, Kim and the New England Philharmonic, with conductor Richard Pittman, will present the Boston premiere in April 2020. Soprano Tony Arnold, baritone William Sharp and pianist Gilbert Kalish premiere my 45-minute dramatic song cycle, “Some Favored Nook,” at the Nasher Sculpture Center in Dallas on January 4, 2019. In March in Providence, soprano Jessica Rivera, baritone Andrew Garland and pianist Molly Morkoski perform the work in Providence as part of First Works’ season on March 3, 2019. The work sets texts by Emily Dickinson and Thomas Wentworth Higginson adapted by librettist Mark Campbell. The Fromm Music Foundation at Harvard University has awarded me one of its 2018 Commissions. I will be composing a new sinfonietta work for the Indiana University New Music Ensemble and conductor David Dzubay to premiere in 2020. The Louisville Orchestra announces its 2018-19 season which includes two performances of "the space of a door" on November 16 and 17, 2018 with conductor Ken-David Masur on a program with Richard Strauss' oboe concerto and Brahms' Serenade No. 1. More information here. Boston Musica Viva has announced its 50th Anniversary season which will include the world premiere of a “Missing Words IV” for chamber sextet to be premiered November 17, 2018 in Boston. The Neave Trio will premiere “Missing Words V” for piano trio (violin, cello, piano) on February 8, 2019 at the Longy School of Music. The Aspen Music Festival and School performed "the space of a door" on July 10, 2018 with Aspen's Conducting Academy Orchestra in the Benedict Music Tent and conductor Joshua Hong. I will be in-residence to give a seminar to students in Aspen's composition program. More information here. The Boston Modern Orchestra Project and conductor Gil Rose performs "Paestum" for sinfonietta at the Library Of Congress on June 2, 2018. BMOP has just finished recording a CD of my orchestral music that will be released on the BMOP Sound label in Fall 2018. Stay tuned! "The most prestigious award that Brown offers to junior faculty, the Wriston Fellowship, recognizes the accomplishments of an assistant professor or lecturer who has demonstrated exceptional ability and dedication as a teacher. Consistent with Brown's emphasis on the essential interdependence of teaching and research, the Wriston Fellow should combine excellence in the classroom with outstanding scholarship." "LUMEN," a collaborative immersive installation for video, sculpture, garden and sound that I created with artist Catherine Wagner, architect Thomas Kelley and landscape architect Loretta Gargan was on display at Brown University's Cohen Gallery from October 5-November 5, 2017. "LUMEN" is an interdisciplinary and multi-sensory experience that reconsiders contemporary spirituality through the pew, a traditional site for prayer. You can read the Brown Daily Herald's feature article here, and see images and videos of the work here. Soprano Jessica Rivera, baritone Andrew Garland, pianist Molly Morkoski and were in-residence at Yellow Barn for an Artists Residency from September 19-23 to workshop my new 45-minute song cycle, "Some Favored Nook." My work sets texts by Emily Dickinson and Thomas Wentworth Higginson adapted by librettist Mark Campbell. It places places Dickinson and Higginson's writings in the context of the Civil War and the society of the time. We plan to officially premiere and tour the work in the 2018-19 season. I composed this work during residencies at Copland House (January 2017) and at the American Academy in Rome (July 2017). Yellow Barn also presented a performance of my "Quartet for Oboe and Strings" as part of its summer festival on July 21, 2017, and I return as my second time as a guest composition faculty member in the Young Artists Program in June 2018. The New York Virtuoso Singers and conductor Harold Rosenbaum premiered my new choral work, "how small a part of time," in New York City on May 20, 2017, and repeated the work at ChoralFest at Symphony Space on June 3, 2017. The text for my work is an original poem that I created entirely from the titles I found in a single drawer in the card catalogue of the Providence Athenaeum, which all begin with the word, “how.” You can read the poem and watch a video of the premiere here. NATIONAL SYMPHONY ORCHESTRA PERFORMS "GLIMPSE"
The National Symphony Orchestra and conductor John Devlin perform "Glimpse" for orchestra on February 8, 2017 on a special concert at the Reagan Building curated by Gourmet Symphony as part of Joshua Bell's residency with the NSO. The event features music paired with creative cuisine and cocktails created by celebrity chef Mike Isabella. Ticket information here. Andris Nelsons and the Boston Symphony Orchestra premiered my BSO-commissioned work, "the space of a door", for orchestra in Symphony Hall in four performances on November 8, 10, 11, and 12, 2016, as part of the BSO's cycle of Brahms Piano Concerti and Symphonies. My piece was paired with music by Brahms in two separate programs, featuring Piano Concerto No. 1, performed by Hélène Grimaud, and Symphonies Nos. 1 and 2, respectively. Listen to the live broadcast on-demand. Click here for more information about the piece including an online viewable score, program note, a recording, and press quotes. The New York Times: "Rich with asynchronous strings, and full of light and shade, it hurtles toward a nostalgic end. Engaging, from a voice we will hear more of." The Boston Globe: "shimmered in sweeping gestures ... and a sense of awe twinkled throughout." Boston Classical Review: "blazing ... clean and shot through with rhythmic vitality ... its formal design and dramatic shape is seamless." The Providence Journal, Brown Daily Herald and Brown University News published feature articles on the premiere. In conjunction with the premiere of "the space of a door," the Boston Symphony Orchestra and New England Conservatory co-presented a concert featuring my "Omaggio a Gesualdo" for string quintet as part of NEC's "Do You Hear What I Hear?" series on November 15th at Williams Hall. On November 5th, Boston Musica Viva performed my "Walls of Light" at the Longy School of Music. Also surrounding the premiere, I enjoyed speaking at Tufts University (October 24), Keene State College (October 25), Boston Symphony Orchestra student composers talk (Nov. 8), Harvard University (November 9), Northeastern University (November 10), From The Top (November 10), Boston Symphony Orchestra pre-concert talk (November 11), Yale University Humanities Center (November 13), and New England Conservatory (November 15). I'm excited to have been awarded a 2016 Copland House Residency award. I will be in-residence at Aaron Copland's house to compose and work on a number of projects, including a song cycle for soprano Jessica Rivera, baritone Andrew Garland, and pianist Molly Morkoski. The American Brass Quintet premiered "Missing Words II" on July 27 for brass quintet, commissioned by the Aspen Music Festival. I was a visiting composer at the festival. The American Brass Quintet presented the New York Premiere of the work at The Juilliard School on October 10, 2016. Stay tuned for news about a commercial recording release of the work with the American Brass Quintet. Violinist Jennifer Koh premiered Nathan's "Far Beyond Far" as part of the New York Philharmonic's 2016 Biennial at National Sawdust. The premiere is part of Koh's "Shared Madness" project, which includes commissions from 30 composers who composed works in response to Paganini's 24 Caprices for Solo Violin and the idea of virtuosity in the twenty-first century. Listen to the premiere on WQXR's Q2 Music here. The New York Times review of the premiere. Watch video excerpts below of the CD release concert of "Multitude, Solitude: Eric Nathan" at (le) poisson rouge from October 12. The concert featured the Momenta Quartet, violist Samuel Rhodes, oboist Peggy Pearson, pianist Mei Rui, trumpeter Hugo Moreno, and hornist Laura Weiner and the New York Premiere of "Why Old Places Matter" (2014). Reviews in The New York Times and The New York Classical Review of Tony Arnold, Lucy Shelton and Dawn Upshaw's premiere performance of "Canon for Three" (2015), and Lucy Shelton, Meaghan Burke and Carlos Cordeiro's premiere performance of "Soul Perching" (2015) at the opening night of both the Resonant Bodies Festival and Merkin Concert Hall season. who was awarded a GRAMMY Award for Classical Producer of the Year for her recordings in 2015, including "Multitude, Solitude"